In this chapter we begin to look at the relationship of science and technology, by initiating an inquiry into the nature of science. Borgmann spends much of this brief chapter painting a rough picture of what people say and think about science. This outline of popular sentiment is important since much of Borgmann’s work is devoted to critically examining common worldviews: “The entire exercise will of course be pointless if no attempt is made to expose today’s normal world citizenship to criticism, to expose its inconsistencies and liabilities, and strengthen its proudest aspirations” (17). Any theory of technology must deal with science since it is crucially dependent on science; without that aspect of human history, the technological paradigm would not exist. Technology can also in some sense be thought of as being in competition with science: science sets the standard of explanation in our time, and Borgmann’s theory of technology may fall under a different standard. (As we will see in later chapters, what exactly a “scientific” explanation even consists of is a problematic question). From the perspective of some kind of sociological intuition, it can be presupposed that people today generally try to give what they consider scientific explanations rather than looking to the wrath of God or flying dragons to explain phenomena. Does this fit with empirical sociological data? Unfortunately, surveys which obtain this data accurately are hard to formulate and/or find. Borgmann’s view is that there is no “clear and common notion” of science, either in the public or in the scientific community. (Anecdotally, my experience is that the philosophy of science (the field which looks at the grounding claims of scientific reasoning and principles) is more or less unknown to scientists as well as non-scientists). The public’s command of scientific facts is extremely minimal (i.e., science is an external authority; the actual knowledge is not owned by people themselves). People generally think highly of science. People respect and trust science more the more they are acquainted with it. (Implying that it proves satisfying in some regard, in some context). One study suggests that people take a “scientific” view when they’re in command of their situation, and resort to religion for explanations when there are no available scientific ones. Facts like these help to address a question which is of primary importance: with what degree of insight does the average citizen of modern technological society apprehend their world? In other words, how deep, nuanced, and structured are people’s worldviews in general? If it turns out that most people have a thin and undifferentiated veneer of “science” slathered on top of not much else, then there is ample room for a critique of modern culture (and its uncritical appropriation of the device paradigm) on that basis. These three sciences have vastly different features and descriptions. Science as a social enterprise is subject to all the vagaries of any such enterprise: ambition, heroism, treachery, jealousy, diligence, etc… In other words, in this sense science is no more privileged than business or politics or religion, as their practitioners will all exhibit similar classes of moral behavior. Science as a body of established laws and theories, on the other hand, has a valid claim to objectivity. The content of a theory is independent of its human origin, and can be proved or disproved in the same way. How scientific laws are used doesn’t change their fundamental essence: they properly attempt only to describe nature. As Borgmann says, “It makes no difference to the validity of a scientific law whether it has been discovered by a Jesuit or a Communist and whether it is applied to kill or to cure” (17). (Of course, which theories gain funding and support is emphatically not an objective fact). It’s this aspect of science that Borgmann wants to distinguish sharply from technology, and we’ll spend more time looking at it in future chapters. In particular, under the supposedly objective nature of scientific laws, there lurk deep philosophical problems not faced by the everyday proponent of a “scientific” worldview. Do all scientific theories have an equal claim to cogency and objectivity? What standard of explanation is relevant when comparing them? Science in its applied form is most akin to what we mean by technology. It arises as a possibility from scientific laws, and both draws energy from and feeds energy into science as a social project. 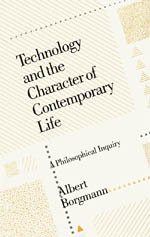 Borgmann is not sure that technology is merely applied science, however, and this will become clear in future chapters. In Chapter 5, we will look at the topic of scientific explanation: how a given theory can be said to be explanatory, and what principles are proposed for distinguishing competing theories which all seem to have some claim to validity. Thanks for the continued summaries… looking forward to more! Something about this strikes me about Borgmann’s insistence throughout the book to make sure to capture internal views of the world. That if we are going to seek to understand and explain phenomena, it is incumbent on us to become up close members of the things we want to explore. This is a core philosophy of my own research. Next Next post: Relay: Is Technology Destroying Jobs?